Have you heard about Blockchain? Exactly we are talking about that emerging & trending technology that has been covered s wide range of industries through its innovative applications. And obvious, the mobile app development segment is not an exception for that. Technologies are always fickle one with different periods, and every raising technology has impetus towards different industries. Must Be Thinking That What Blockchain Is? Well, Blockchain is a distributed network o ledgers for contracts, transactions, and in digital account process. For the people, formerly known as cryptocurrency networks is Bitcoin. These are digital currencies and developing through the Blockchain process only. As this technology is widely famous for its secured networks, most of the industries such as education, banking, healthcare, etc. are integrating Blockchain technology into their business operation to make their data secure in this decentralized system. If we talk about to data storing than, in this decentralized system data is widely distributed and stored in different locations to ensure the best security. Interfacing this scattered network is a tough task, where each block is interlinked with another one by a cryptographic hash. In this system, every data in this chain has transparency to all the elements in the network. By adopting its advanced and intuitive features, mobile app development industries are placing many efforts in including of Blockchain technology with applications. To prevent the data from insecurities, theft, leaks and other threats, various mobile app development services are continuing to develop the app by integrating Blockchain technology into their process. Does not matters that, this inclusion of Blockchain technology in mobile app development is in its initial phase because it is having a vast pave for revolutionizing the mobile app development industry. It is benefiting the mobile app developers for preserving the digital information. Although encryption of the available data is a tough task, however, it also provides a high level of security by allowing multiple accesses after proper verification if personalized data. As it increases the security point of view, the mobile app development process also gets more advanced. Currently, this technology has been used only in cryptocurrency, but in the future, there are more chances of usability in various industries. Data in interlinked through blocks and everything is recorded as a ledger in which all the users can track the information at every network point. Hence, it is hard to create faults in the network quickly, as it turns the network into the most secured network. Each member of the network can see the data; hence user does not need to trust each other. By merging blockchain with mobile apps, it enhances reliability because of high fault tolerance. The app, which stores too much data, can be benefitted by the inclusion of this technology. It is quite easy to integrate, develop, & maintain. In business, the main thing that needs to be considered on the first step is user retention. The moves of users can only measure user retention. By analyzing the users’ movements and decoding the users’ behavior towards the app, user retention can be sustained in the business. Well, to sustain the user retention completely, app developers should pay complete attention towards the inclusion of more new & advancing features regarding user engagement & User experience. Including Blockchain to mobile app development, developers can analyze the user’ behavior and can able to know that what the user wants. Public Health: By utilizing blockchain technology, regulatory bodies can create a shared stream of de-identified patient data. This stream will help the management to find out the threats so that they can take better care of the patient. Data Security: It is the smarter solution to save the patient’s data. It prevents unwanted access. Managed consent: Patient can allow any specific to access their personal information. Easy claim process: It simplifies claiming process by eliminating the series of validation in the medical billing process. Patient Generated data: Patient will be able to upload their medical information with messing up any previous record. 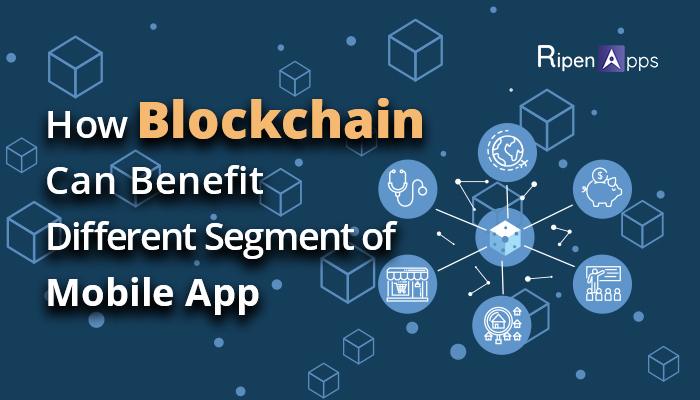 Developing apps for the healthcare industry by integrating blockchain technology will enhance the security features in the application & make Healthcare app more reliable & secure for the patient as well as for the doctors too. As the power of online and distance learning grows, so does the need for an independent way of verifying students’ transcripts and educational records. A blockchain based educational mobile application could serve almost as a notary for educational documents, creating a way for employers and other educational institutions to access secure records and transcripts. It was just a matter of opportunity before Blockchain arrival. The blockchain is a reliable & secure technology, which provides security in data preserving. Due to these properties, blockchain has stable things to move things up in the commercial & real estate segment & transform how business operate recently. It reduces the time for settling activities included in the return of rents and capital expenses. It provides transparency in the manner of supporting property-related activities. It saves Cost in the methods of determination, agreement, and property administration, therefore, guaranteeing a softer and risk-free transaction. The travel business depends on several organizations transferring data between one another. For example, travel agencies require transferring client details on to flight corporations and resorts, while the private belongings of passengers are frequently moved between organizations and followed too. Blockchain can make obtaining and collecting relevant data more straightforward and more reliable because efficiency for managing it is distributed over the entire interface. By integrating Blockchain to the mobile apps of travel & tourism, data collection and data adoption will be more simplified. If executed correctly, blockchain could enormously help online business and retail regarding development, deals, and promoting. The retail business has just begun seeing the progress and benefits of offering customer products and ventures utilizing blockchain technology. The Internet goes about as an incredible stage to advance nearby organizations and other substance on the web. However, there is dependably the danger of content getting utilized without legal authorizations at different spots. This copied substance can be checked through the time-stamping strategy of the blockchain. This will safeguard originality. Payments: With the help of blockchain integration, a large number of transactions can secure. Transparency: An honest blockchain interface will implement a simple supply chain where customers can observe the distribution flow of the outcomes they buy, supporting boost customer trust. Safety: One of the main benefits of blockchain towards e-commerce is it is impossible for a hacker to hack the nodes of blocks. So it’s considered to be relatively safe. Blockchain decentralizes authority and produces consensus-based business externally the necessary for a primary influence. It allows customers to combine with businesses or other consumers, eliminating the agents from the method. That being said, Blockchain is not a mystery anymore to modern businesses. It is going to be a 20 Billion Market by 2024, and on an average, enterprises are investing $1 million in Blockchain projects. Furthermore, 69% of banks are experimenting with this technology, and the number is increasing. Hence, this is clear that Blockchain is the next big thing for the financial sector. The upsides of blockchain development are just brushing the surface as the world reveals its capacities. From quality affirmation and savvy contracts to the stock trade and global exchanges, organizations are bouncing on the blockchain passing trend in large numbers. Mobile app development will keep on ascending as new businesses utilize the blockchain innovation to cooperate with clients from a wide range of devices.